Francis Vallejo | blog: Le Dans Macabre group exhibition! 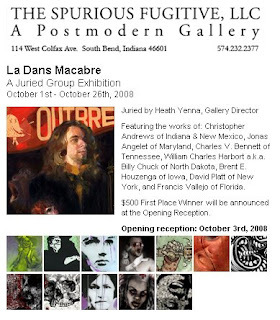 Le Dans Macabre group exhibition! So I forgot to mention that I have 2 paintings in a show at the Spurious Fugitive Gallery that opened this past Friday in South Bend, Indiana. Fortunately the show is up until the 26th of October. If you're in the area and check it out, let me know. I couldn't make it to the gallery and am curious with how the set up looks. Love that gestural figure with the spattered head....looks like a large piece, I want to see it finished. Sweet stuff man.....Gangbusters! Thanks man coming from you that means a lot. I am positive that your gonna kill it! Dude enjoy Illest for me man, I wish I was there to partake in the celebration of all things Ill! Yeah dawg just call me when ever. We will get this story of yours crackalacin!